EETimes: Micron currently produces CMOS sensors in Boise, Idaho, and Avezzano, Italy. It is converting another Boise plant and one in Nishiwaki, Japan, to sensor production. Each of the four fabs has a production capacity of 50,000 8-inch wafers a month. The company predicts the image sensor market will expand from 800 million units this year to 1 billion in 2007 and 1.7 billion in 2010. It claims its shipments have accounted for 36 percent of the total volume shipped this year to date. 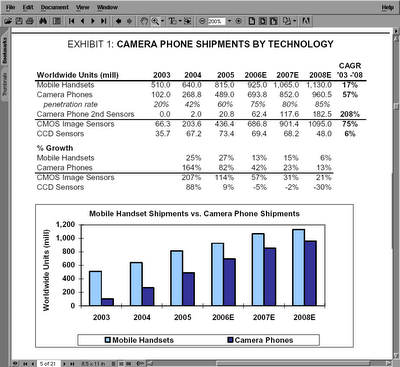 Micron has been focusing on camera phone sensors and claims to have accounted for 33 percent of the total market for those devices in 2005. Broadcast Newsroom: Altasense announced two 1.3MP HDTV sensors using its patented "tapered reset" technology by Les Kozlowski, its CTO nad Founder. Both 1.3 megapixel sensors generate progressive 12-bit digital video at 1280 by 720 resolution and 75 MHz pixel rate, resulting in 720/60p HDV or 50 Hz SXGA. The 2462 sensor supports single-chip cameras with the latest RGB color filter and microlens technology. Its maximum power dissipation is 350 mW. The 2460 sensor is the monochrome counterpart sensor with advanced microlens array for low-power 3-CMOS cameras. 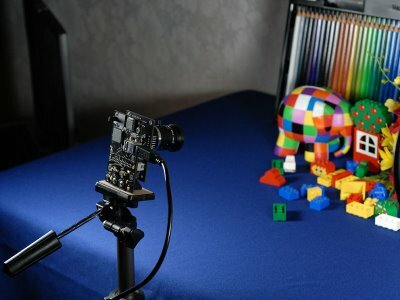 2462 sensor uniquely delivers minimum SNR of 47 dB at only 500 lux and cost-effective f2.8 aperture while recording at 60 Hz. "The CMOS sensor is the camera. It's a semiconductor on which you can embed all the wonderful and powerful software we have in this company for light management, for color management, anything else you need to get a beautiful picture. The CMOS sensor will be located in all sorts of these small clients that will be evolving in all sorts of shapes and forms. We hope that Kodak will be the leading supplier of a component in which we will put all of the technology and know-how we have accumulated for 100 years in how to deal with images and videos." Let's wait and see what will be the fruits of Kodak efforts in this area. Rumors are running rampant that OmniVision lost some CMOS image sensor business at Motorola, notably a socket within the popular Razr line of cellular phones. American Technology Research CEO, Richard Prati, has “two industry sources that are confident that OminVision will receive no volume for the Razr,” according to a report from the research firm. OmniVision’s response? “We don't comment on specific models, but our ultra thin VGA will be ramping during our July quarter. Additionally, we continue to have strong relationships with all of the top 6 handset makers,” according to a spokesman for OmniVision. At Moto, Micron has apparently taken the business away from OmniVision. But OmniVision still thinks that they some won VGA business, according to the research firm. 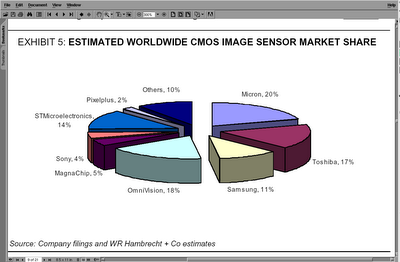 Micron dominates the Moto account for CMOS image sensors. “Micron has massive 75-80 percent market share at Motorola and OmniVision has 15-20 percent market share,” according to American Technology Research. One of OmniVision's biggest customers for CMOS image sensors is Nokia, it was noted." "Modern CCD readout noise is equal to or worse than modern CMOS active pixel image sensors. This idea that CMOS is inferior dates to the mid 1990's. It is just not true any more. Sensitivity, noise, full well, and in fact every important metric is now resolved in favor of CMOS. 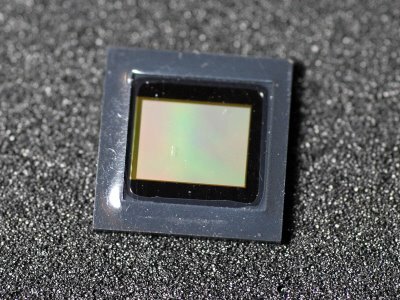 Ergo, Sony investing $1B in a CMOS image sensor plant. Now, not all CMOS is equal. Micron, Sony, ST, and Samsung make high performance CMOS image sensors. Omnivision, Magnachip, Kodak (IBM), Cypress, Foveon and others are currently 2nd tier in performance. 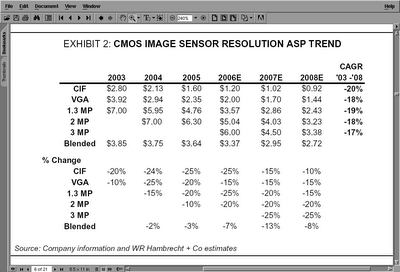 Obviously Canon is making good CMOS image sensors but at a much higher price and a much lower level of sophistication. Pixel sizes less than 3 um are much harder to make work well than larger pixels so I don't count Canon in the top tier. WR Hambrecht published a research report on Pixelplus, dated by March 20, 2006. 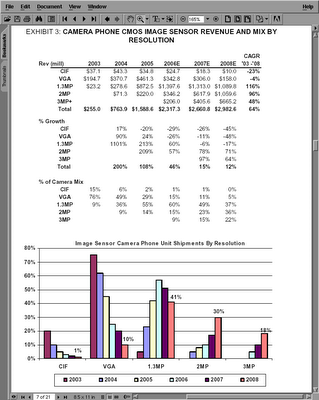 The report contains a lot of interesting data on Pixelplus and also image sensor market analysis. The report stresses that Pixelplus uses 3T pixel technology, while most of other market players moved to 4T. Pixelplus adds some CCD functionality to 3T pixel (this probably means a pinned photodiode) and also enjoys better yield and cost of older process. Pixelplus currently employs total about 86 people with 27 in R&D and 14 in marketing and sales. Pixelplus customer list includes Pantech, Rohm, Seiko Precision and SII, Sharp, LG, Logitech, BYD, China TechFaith, DART Express, DK Semicon, Ningbo Bird, Cellon. Its current fab partner is DongbuAnam for 0.18um process and Pixelplus is process of qualifying UMC 0.13um image sensor technology. Japanese digital photography site Impress Watch published pictures from Micron MT9E001 8MP 1.75um sensor presentation by Hisashi Suzuki, Micron's director of marketing. The board was connected to plasma display. No full resolution sample image is published so far. Micron published a flyer on 8MP 1.75um pixel prototype. A few additional details include 12b dual ADC and 2.8/1.8 dual supply. The flyer states that chief ray angle is just 7.5deg. - way too small for an efficient optics. If not a mistake, this might indicate a serious limitation of the new Micron 1.75um pixel. "Using a tiny 1.75-micron pixel design, Micron Technology (NYSE:MU - News), Inc., has built the world's first 8-megapixel image sensor in a 1/2.5-inch optical format, the standard size for mainstream digital cameras." Also, the press release mentions it's a prototype, rather than production-ready sample. Sampling is planned for the fall of 2006 with mass production expected in the first half of 2007. Even more exciting news is that Micron announced its work on a 1.4-micron pixel and unveils pictures taken with test chip. No details is given about this new generation pixel. Yahoo! : Micron announced 8MP sensor "that enables pocket-sized cameras and cell phones to capture bursts of 10 high-quality photos in a single second or even high-definition video." 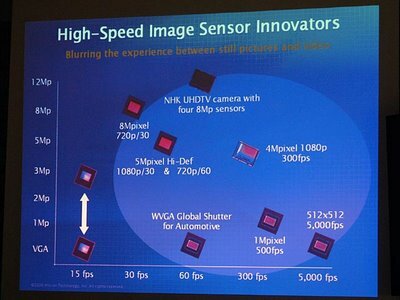 "Micron's new sensor includes a faster processor that eliminates usual point-and-shoot delays between taking pictures. That means users can shoot up to 10 images per second at 8-megapixel resolution or 30 frames per second at a resolution of 2-megapixels." 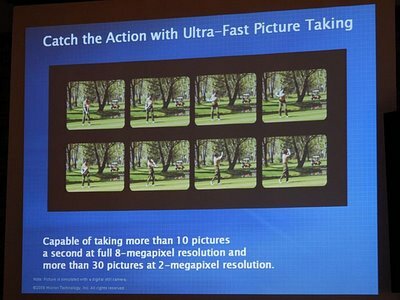 Following last month's Sony fast sensor announcement, Micron too said: "The sensor's rapid capture rate and high resolution also allows smaller cameras to incorporate features such as image stabilization." No word on pixel or sensor size, but with imminent introduction of 1.75um pixel generation one can safely assume the new sensor uses this latest generation of pixels. 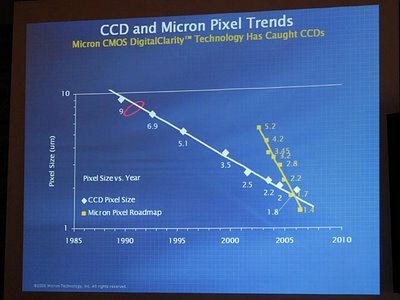 "Micron expects the worldwide CMOS sensor market to grow from 540 million units in 2005 to 1.7 billion in 2010, for about 25% annual growth. 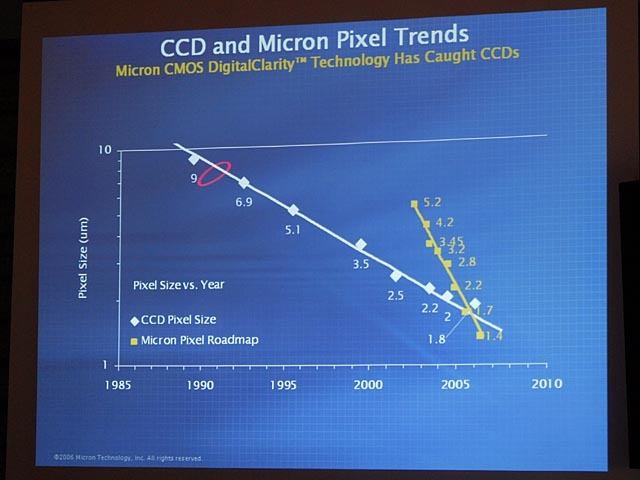 So far, Micron's sales of CMOS sensors have grown much faster than 25% annually. In 2003, sales amounted to just $16 million, but by 2005 they had grown to $303 million. Strong growth is continuing this year and totaled more than $313 million (12% of Micron's overall sales) in just the first two quarters of fiscal 2006. In a very short time, Micron has scooted out in front of Omnivision Technologies (Nasdaq: OVTI) and owns the industry-leading market share. Furthermore, the gross margins were more than 43% for the image sensor business -- much higher than the 15.6% gross margin for the combined DRAM and specialty memory segment. As you might suspect, the strong growth in CMOS sensors hasn't gone unnoticed, and many competitors are pursuing their own chunk of the market. While Omnivision and Micron together control about 60% of the market, the remaining 40% is split among companies such as Toshiba, MagnaChip, Sony (NYSE: SNE), ST Micro, and Avago. While I don't expect that the competition will go away, Micron will most likely remain a significant player in the market for CMOS sensors." BusinessWire: Eco-Snow, a division of BOC (NYSE: BOX), has launched a novel dry cleaning process to remove the particles that accumulate during manufacturing and which reduce image sensor yield. The process utilizes the patented Eco-Snow(R) VersaClean(TM) 1200 system. "Particles are the main cause of yield loss for makers of imaging devices. Traditional wet and dry cleaning methods have tradeoffs in terms of efficiency, effectiveness and environmental impact and cost. The Eco-Snow process injects carbon dioxide snow under high velocity and pressure onto the imaging device's surface, removing the particles more effectively and efficiently than alternate methods," said Joe Clark, general manager, Eco-Snow Systems. If it works well, it might bring a major yield improvement in image sensor manufacturing process. Yahoo! : Pixelplus unveiled new second generation PlusPixel(TM) SoC image sensors with pixel size of 2.2 and 2.6 micron in 0.13um process. The new PlusPixel(TM) SoC image sensors incorporate an on-chip regulator, a high-speed serial interface (is this SMIA or MIPI? ), and an integrated auto focus function and image processing engines such as color interpolation, auto white balance, color correction, gamma correction, and auto exposure. So by now almost all the major CIS makers reached 2.2um pixel pitch milestone. "The sensors are capable or photographing high-definition video at 60 frames per second or 300 frames per second at a lower resolution. At present such fast frame rates are only available on very expensive specialist cameras but new CMOS (complementary metal oxide semiconductor) sensors, which were unveiled at a conference in the U.S. earlier this year [probably ISSCC'2006], are heading to consumer cameras." "The sensors might make capturing that perfect shot easier. Because of their speed users will be able to take a series of up to 8 images in an eighth of a second and then choose the best one or grab a better image from a video. Current sensors aren't fast enough to allow grabbing of good quality images from video, according to Sony." It appears that just 8 frames is a limitation of memory or on-the fly processing. Otherwise I would expect more frames to be captured. "To compensate for the smaller pixel, which impacts light capture, Avago developed some patent-pending changes, namely the multiplexed EP pixel architecture to ensure higher sensitivity. While the multiplexed EP pixels still use four transistors as in the earlier non-multiplexed version it allows the fourth transistor to be shared across three to four pixels. This design change translates into smaller die, increased fill factor, lower power consumption, less heat generation, and ultimately, improved sensitivity and imaging." 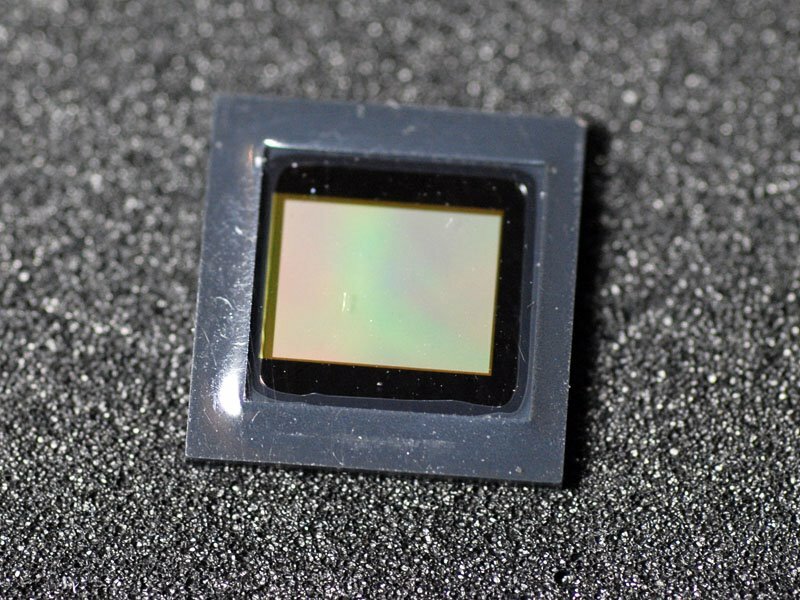 "The ADCC-4050 is one of the few 2-megapixel sensors with 2.2 x 2.2 micron pixels that fits into the industry's smallest 8 x 8 x 5-mm low-profile camera modules." "The ADCC-4050 CMOS camera-on-a-chip is priced at less than $5.00 in quantities of 1 million. Samples are available now with volume production planned for third quarter 2006." Avago announced sampling of its first sensor with 2.2um pixels, being one of the last major CIS manufacturers in the pixel size race (BusinessWire). The ADCC-4050 sensor has embedded ISP with "eighth-generation JPEG with adaptive compression, which delivers better quality images, auto thumbnails and fast reload to avoid missing shots. It also features fast auto focus, dual flash support, shutter lag amelioration, and an advanced auto illuminant detector using second-generation plausible illuminant." The 1/4" sensor has 2MP resolution, its speed is 15fps at full 1600 x 1200 resolution, and 30fps in 800 x 600 SVGA mode.